There’s more to see in Room 2 of the Gallery, where artist Mary-Ruth Walsh presents works from “The Transparent Stillness of the Turning World” in the third contribution to the German-Irish project organised by Jürgen Grölle and Anya von Gosseln. Here the eye is immediately drawn to three radiant blue works, “blueprints” developed in a laborious process. Inspired by the architecture of Eileen Gray, the Irish artist’s works represent oversized versions of the plastic packaging we’re familiar with from supermarkets, dead material, which, when taken out of context, calls to mind futuristic architectural structures. 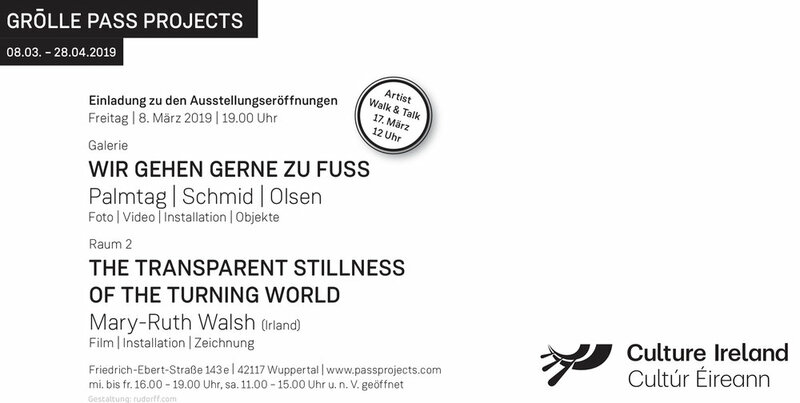 Grölle Pass Projects, RAUM2, The Transparent Stillness of the Turning World opening 8 March - 28 April 2019 - new collages, paintings, blueprints and a selected film from Walsh’s archive. Galerie showing Palmtag, Schmid and Olsen - photos, video, installation and objects. Gemma Tipton chaired a panel discussion on Still Life, a commissioned exhibition for Wexford Arts Centre, Ireland. She explores the question of what to do with our old courthouses and country houses, and suggests they are turned into shopping centers or art galleries. Still Life is at its “most compelling in the film which lulls the senses in the same way that architecture, air, sound, smell and surface are all orchestrated to so do in the highly artificial atmosphere of the shopping mall”…'“there is a seductive beauty” to these works. Phoenix Rising, conceived and curated by Logan Sisley, invited six artists to respond to Dublin City a hundred years on from Scottish biologist, sociologist and planner Patrick Geddes' invitation to visit Dublin. Inspired by Patrick Geddes, Dublin's 1914 Civic Exhibition attempted to re-imagine Dublin as "the phoenix of cities" during a period of economic, social and political strife, see Hugh Lane.